Last modified: September 6, 2017 at 2:16 pm by Charles C.
How to backup formula files before re-install the IDwedgePro software. IDWedgePro is still operating properly on the target machine. IDWedgePro is not working properly, but the SuperIDWedge.sdf file can be accessed in the C:\tokenworks\idwedgepro directory. Instruction for the Backup and Restore of the formula file for IDWedgePro when IDWedgePro is operating correctly. Copy the file: SuperIDWedge_xxx_xxx.sdf to a different drive or removable media. Click on the archive to restore or navigate to the media that contains the archive and select the SuperIDWedge_xxx_xxx.sdf file and click open. 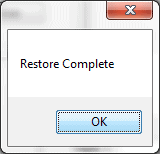 Click OK, You have just restored your formulas. Instruction for Backup and Restore of the formula file for IDWedgePro when IDWedgePro is not operating correctly. Copy the SuperIDWedge.sdf in the C:\tokenworks\idwedgepro directory to desktop or documents directory. 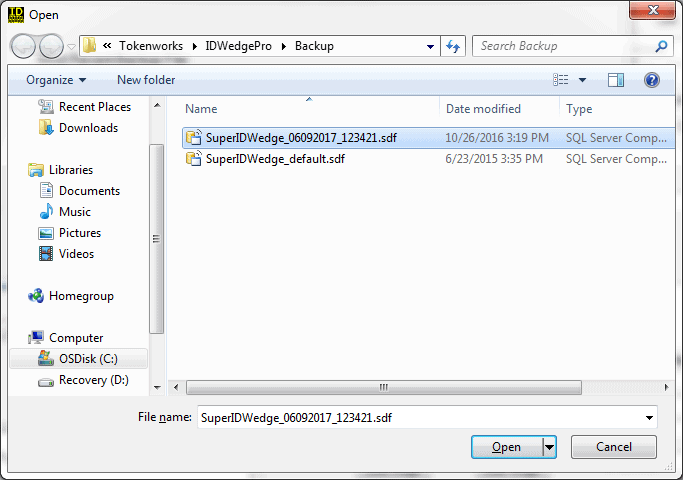 Copy the SuperIDWedge.sdf previously saved to desktop or documents directory back to C:\tokenworks\idwedgepro directory. Step three will overwrite the default version of SuperIDWedge.sdf with version with latest formula.